where is a universal constant of nature called the permittivity of free space. which is the static version of Faraday's law. The static electric field, , surrounding two capacitor plates is an example of an irrotational vector field. is true for any sufficiently smooth scalar field for and ensures that the field is irrotational. The negative sign for the electric potential is an old convention. The electric potential field, , surrounding two capacitor plates. The usefulness of this equation in engineering applications is limited due to its inability to represent dielectric materials. To remedy this problem, the theory is extended with the effects of induced polarization. The field around an object of higher permittivity than its surroundings. The images show a dielectric object, , surrounded by air, , between two capacitor plates (not shown). The top and bottom electrodes have a positive and negative electric potential, respectively. The image to the left shows the magnitude of the electric field, , in color and its direction with arrows. 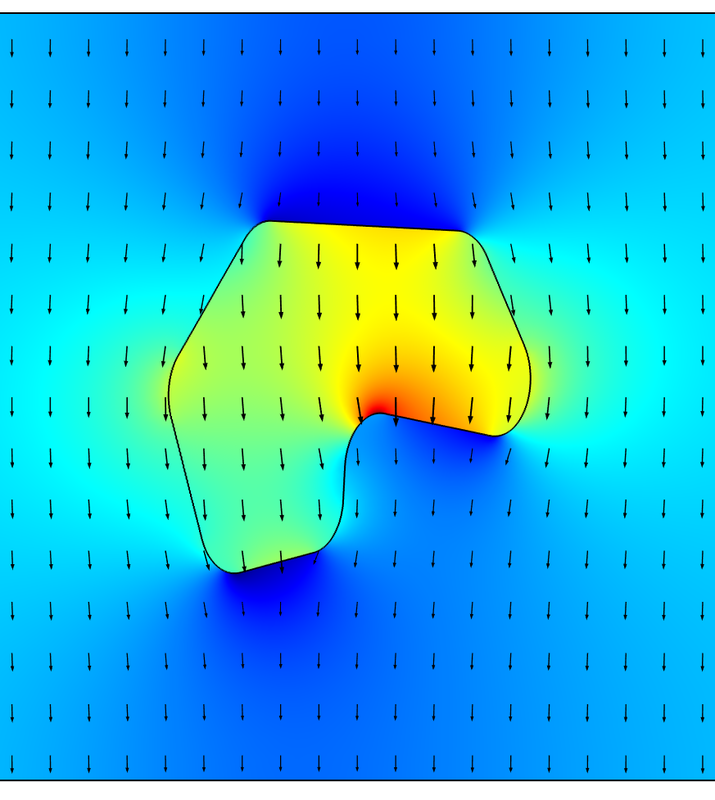 The image to the right shows the magnitude of the electric displacement field, , in color and its direction with arrows. Red and blue represent a high and low magnitude value, respectively. The field around an object of lower permittivity than its surroundings. The images show an air cavity, , surrounded by a dielectric material, , between two capacitor plates. The top and bottom electrodes have a positive and negative electric potential, respectively. The image to the left shows the magnitude of the electric field, , in color and its direction with arrows. 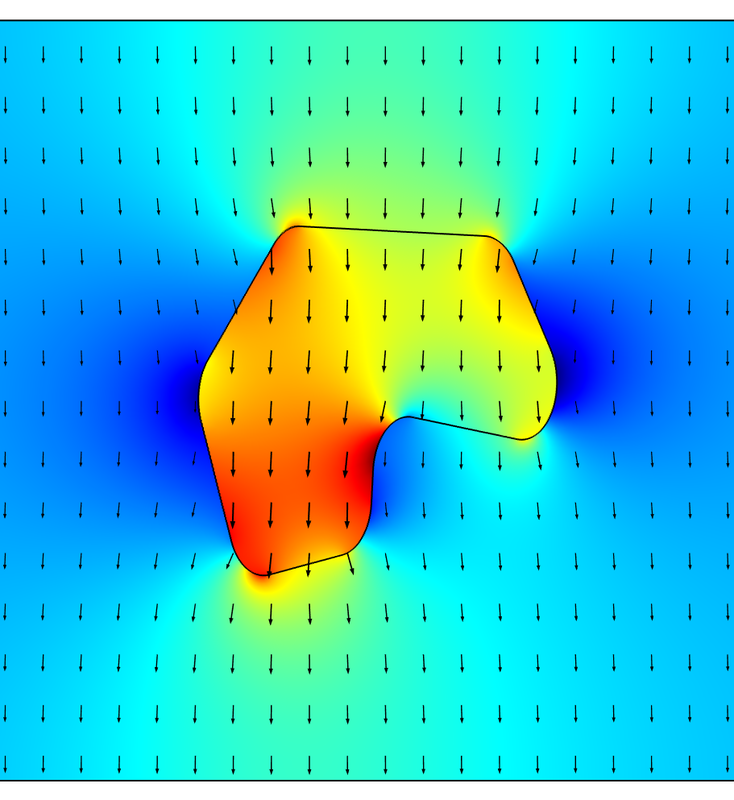 The image to the right shows the magnitude of the electric displacement field, , in color and its direction with arrows. Red and blue represent a high and low magnitude value, respectively. where the constant of proportionality, , is the electric susceptibility. and two new useful quantities can be introduced: the relative permittivity, , and the absolute permittivity, . This implies that for certain materials, the and fields may not be perfectly aligned. Gauss's law and Faraday's law can be seen as specifying conditions on the divergence and curl of the electric field, respectively. According to Helmholtz's theorem, this determines the electric field up to a constant. As a side note, this unknown constant is what ultimately makes it necessary to specify a ground level for the electric potential. 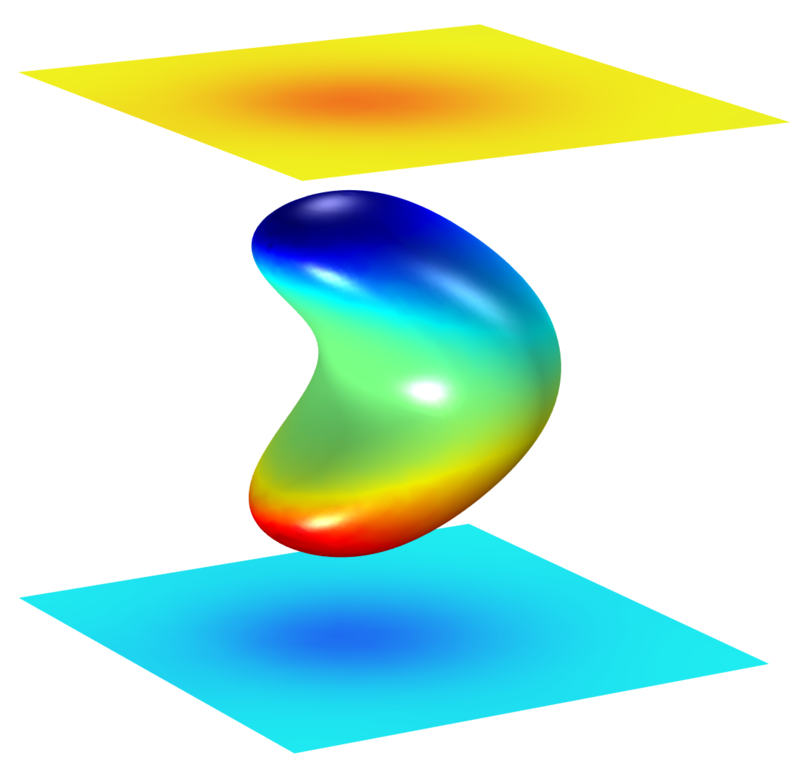 At material interfaces, the divergence condition implies a condition on the normal component of the field and the curl condition implies a condition on the tangential component of the field. Material interfaces represent discontinuities, and to more easily understand what conditions to impose on boundaries, the corresponding integral forms are usually used. 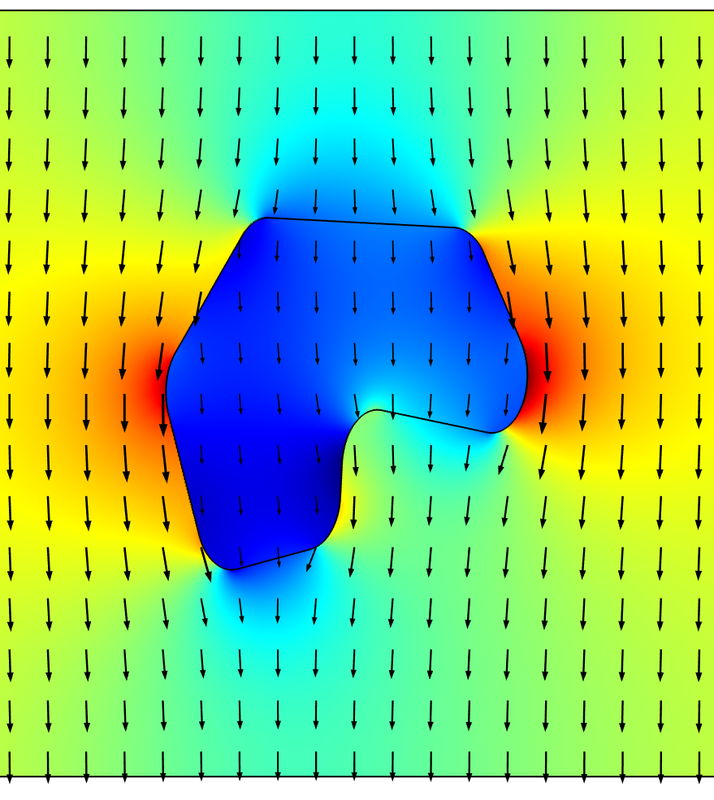 The boundary formulations are then derived by taking the limit of a shrinking closed surface (Gauss's law) and the limit of a shrinking closed contour (Faraday's law), respectively, which enclose a portion of the material interface. where is the volume charge and is the surface charge at the material interface. 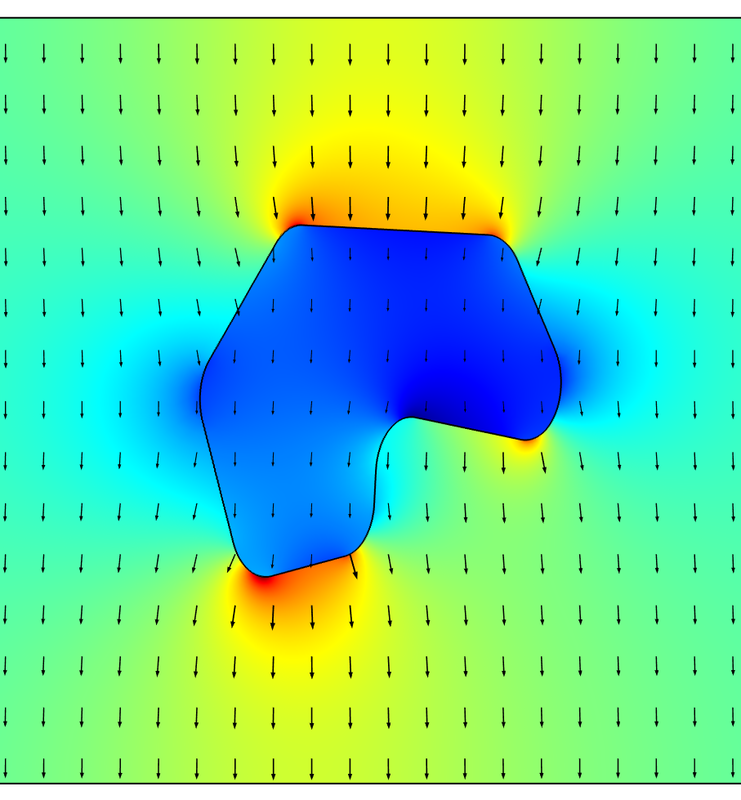 The simulation to the left shows the induced surface charge density on perfectly conducting metallic objects, while the simulation to the right shows the electric potentials. In the right image, red and blue represent a positive and negative potential, respectively. The top and bottom plates are held at fixed, but different, electric potentials. 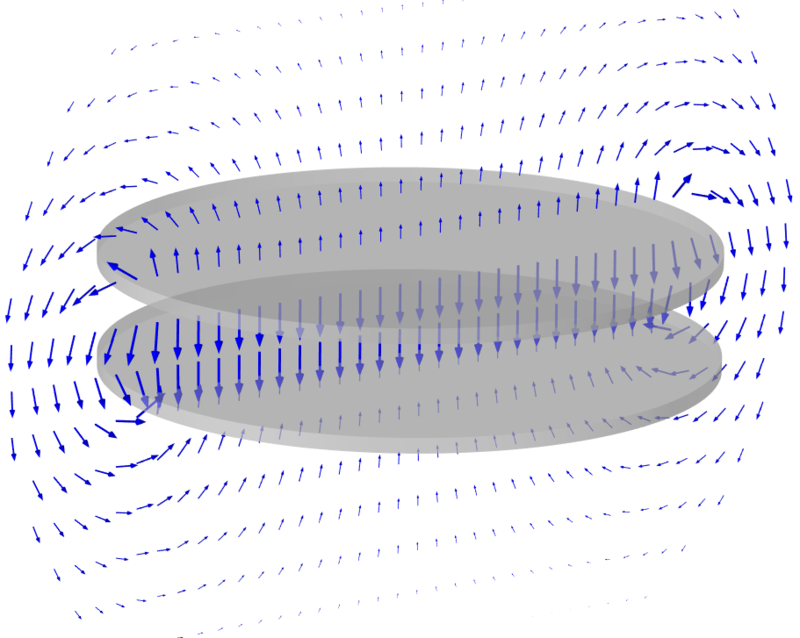 The middle closed surface has an induced constant floating potential, which, due to symmetry, is the average of the potentials of the plates. The surface charge density is distributed so that each metallic surface is an equipotential surface, an implication of Gauss's law. Gauss's law All field lines start and end on charges. The total flux through a closed surface equals its enclosed charge. The surface charge at a material interface equals the jump in the normal component of the displacement field. Faraday's law (electrostatics) The electric field is irrotational. The electric field is conservative. 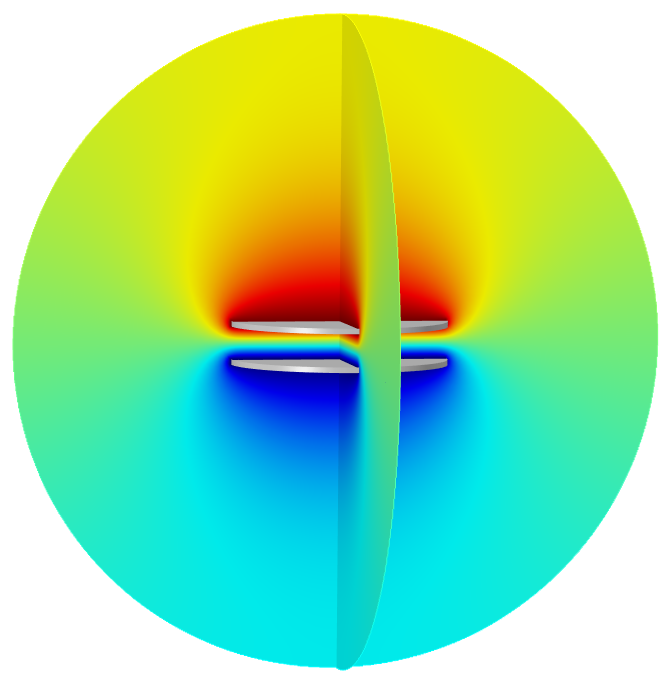 Across a material interface, the tangential component of the electric field is continuous. It should be noted that for the time-varying case, the electric field is not irrotational, and Faraday's law gets an additional term corresponding to electromagnetic induction. 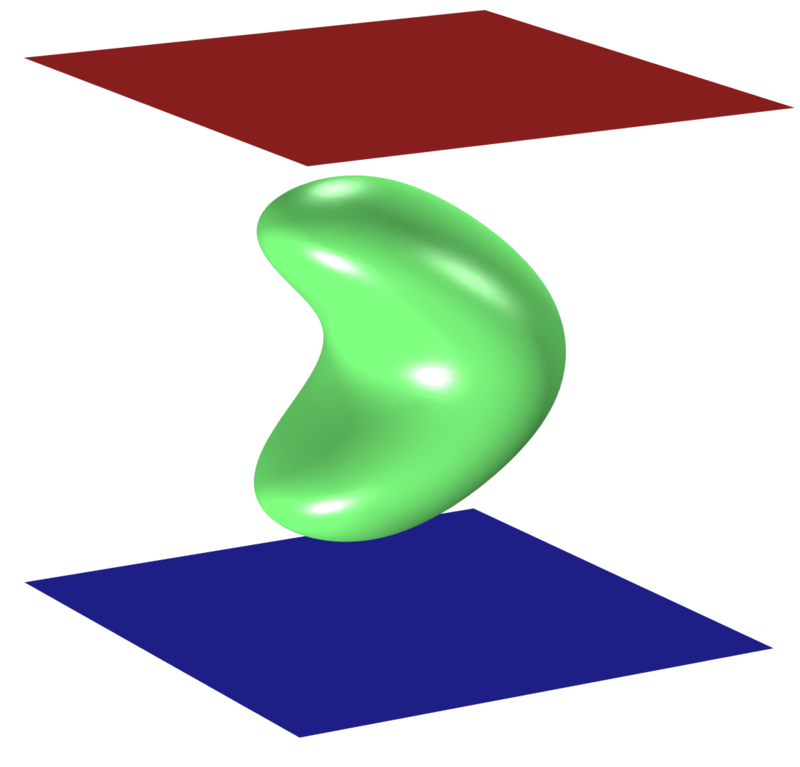 Two charges of opposite signs are enclosed within the green and blue spheres. The electric field is visualized by cyan flux lines. The red sphere has no enclosed charge. 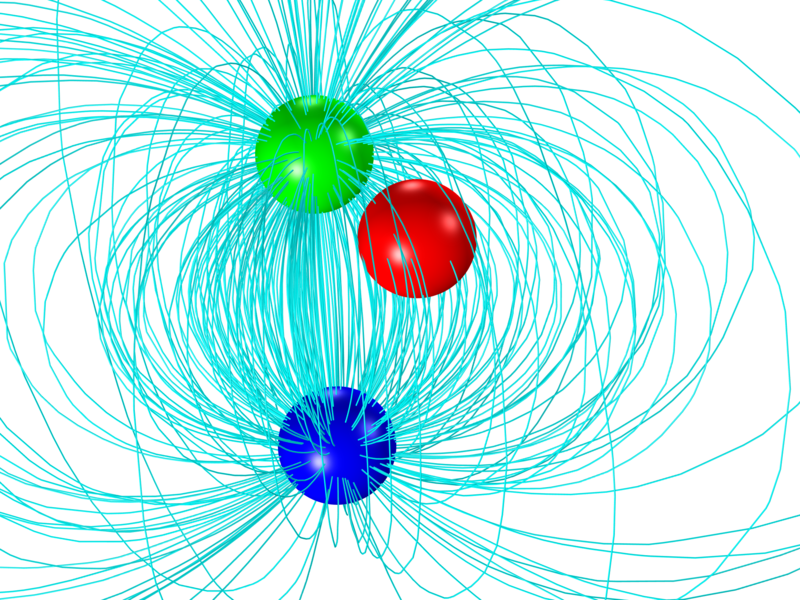 Gauss's law states that the flux of the electric displacement field through the green sphere equals the enclosed charge, and similarly for the blue sphere. The red sphere with no enclosed charge has as many incoming field lines as outgoing ones, corresponding to a net zero flux. Notice that the localization of electrostatic energy density has a limited physical justification (see also: The Feynman Lectures on Physics, Volume 2.
and the two expressions for energy can be shown to be equivalent. The concept of electrostatic energy is useful when computing electrostatic forces and capacitance values.